This hotel is the definition of minimalism: no walls, no roof and no bathroom either (don’t worry: there’s one 10 miles down the road). But what The Null Stern Hotel offers is a prime location 6,463 feet above sea level in the mountains of Graubünden in Switzerland. 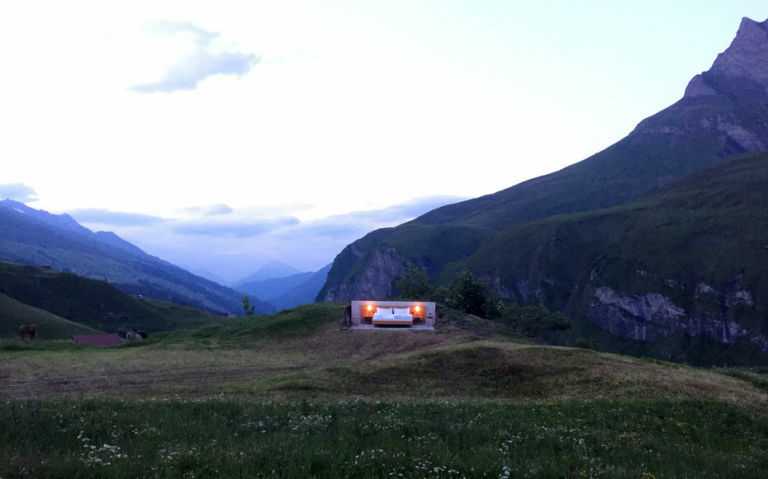 The double bed hideout was designed by Swiss conceptual artists Frank and Patrik Riklin for the Art Safiental land art festival, but has since been turned into a $250-per-night experience — weather permitting, of course. And even though it doesn’t come with some of your standard hotel amenities (cough, a toilet, cough) it makes up for it with a butler service, welcome drink and breakfast basket. With views like these, we’re sure guests welcome a distraction-free evening. Wouldn’t you?